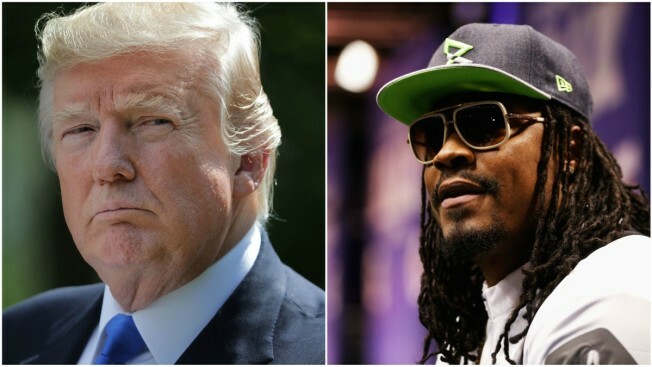 Trump wants Marshawn Lynch suspended by the NFL i f he continues his National Anthem protest. President Trump took to social media Monday to slam Oakland Raiders running back Marshawn Lynch for not standing during the U.S. national anthem as the team played the New England Patriots in Mexico Sunday. Lynch, who has not stood for the anthem since returning from retirement at the beginning of the season, was spotted standing during the Mexican anthem. "Great disrespect! Next time NFL should suspend him for remainder of season. Attendance and ratings way down," Trump tweeted Monday morning. Lynch is among the NFL players who have refused to stand for the national anthem in a movement started by former San Francisco 49ers QB Colin Kaepernick, who began his protest last year to draw attention to racial injustice and social inequality across America. Critics of the protest have slammed it for being disrespectful to the U.S. military and armed forces. Trump's prior calls for the NFL to suspend kneeling players have not yet produced a rule change. Commissioner Roger Goodell said last month in a memo that the league believes everyone should stand for the anthem, but still does not mandate it.